Oh yeah. I should have also mentioned that there was a pretty gnarly teeth bashing scene in there, as well as some groovy over-the-top soundtrack music from the band Goblin. Only sweetens the deal if you ask me. The focus is on that random mechanical doll in the cute little tuxedo though. As he trollops towards Professor Giordani giggling like a school boy, you can’t help but be a bit terrified. 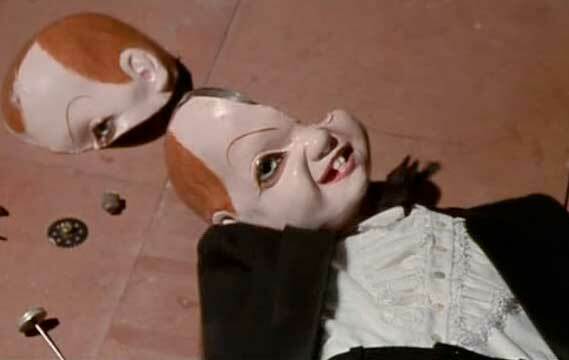 And even though that particular doll is only on screen for about 25 seconds total (and that includes his lifeless porcelain broken body on the floor), it’s a scene and image that is synonymous with the movie Deep Red. This is classic Argento, and being that we can’t seem to find classic Argento anymore, we need to relish in moments like this from his previous films. So here’s a salute to that little mechanical doll in the cute tuxedo who likes to giggle a lot…….you single-handedly managed to Give Me The Creeps.